Stunning Sterling Silver and a trio of White Freshwater Cultured Pearl Earrings. 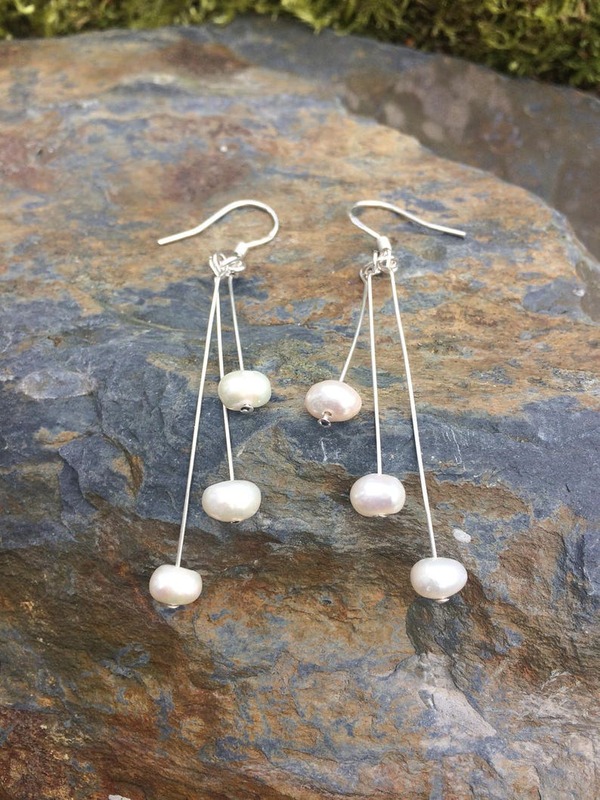 These earrings feature three white freshwater pearls and suspend from sterling silver wire. The ear fittings are sterling silver shepherd hooks. Great for my mum, with lumpy knuckles, being adjustable. Very pretty. Amazing. My Mrs loves them!!!! Sterling silver jewellery will naturally tarnish when it comes into contact with oxygen so should always be kept in a sealed bag when not being worn. Clean it with a silver polishing cloth and if necessary, some silver cleaning solution to maintain it in its original condition. Try to remember to remove jewellery when carrying out household tasks and avoid contact with moisturisers, perfumes etc as these will affect the finish of the item. Store each item separately in an airtight container or box to avoid damage. The Gemstones I use in my pieces are natural and no two pieces will be the same. Opal is a very porous stone and so you should avoid wearing in water.